What an adventure this runner was! 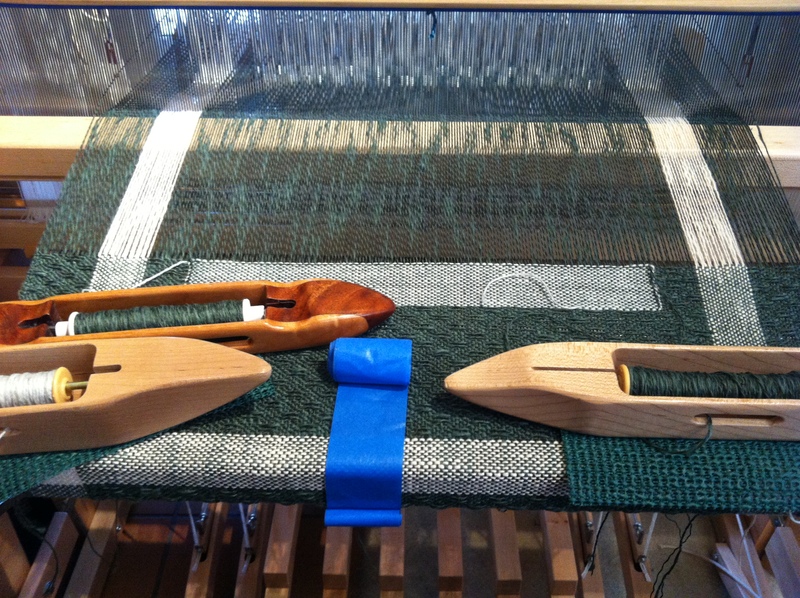 The weaving was rather slow because of the 3-step placement of each weft, but it did go well. The shocker was when I machine washed the sample woven at the end of the warp, and still got really awful tracking in the plain weave center section. Not at all attractive. My only solution was to hand- instead of machine-wash the piece, and that meant it wouldn’t shrink as much as I had planned for. The piece would be way too long. I took about 2 inches off each end by pulling out warp threads and re-situating the hemstitching, and I actually like the proportions better that way. I hand washed as instructed for crabbing in Peggy Osterkamp’s book, and ironed dry, and it did shrink a little. The center plain weave section will hang off the ends of the table by about 2 inches, but that could be nice. There’s a photo in the gallery of the runner on their table. They loved it!!!! I have some lovely friends who got married in the fall, and I have been working on a runner for a small table in their entry hall. 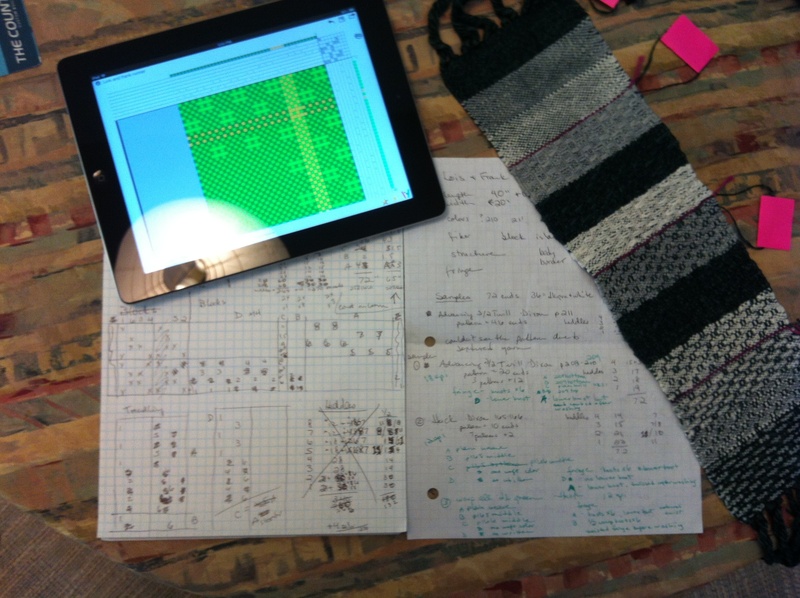 It was great fun having them pick out the yarn, weaving samples, and working with them on the design. 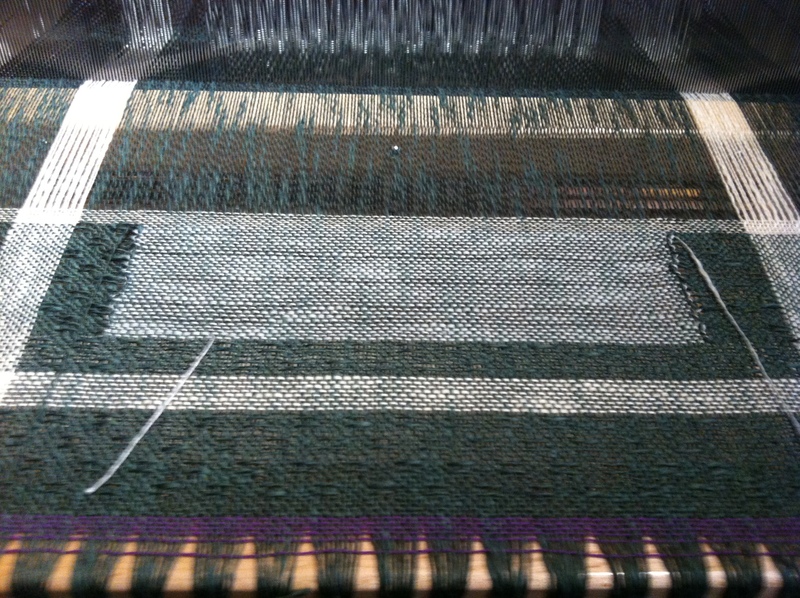 It was going to be a simple plain weave (light green) with huck lace (dark green) at the ends, but the guy asked a last question – would it be possible to have a side (lengthwise) border using the same dark green (warp and weft) as are on the ends? My first response was – no, sorry, it’s impossible because the light green weft has to go all the way across. He was fine with that. Silly me, I kept thinking about it and realized it could be done using a modification of clasped weft technique. They said that would be great, and off I went to figure out how to make good on this promise. (Other people have an actual form they fill out to document this info, but my planning tends to be a little free-form.) It was fun figuring out how to set up the blocks. I remember reading somewhere in Peggy Osterkamp’s book that setting up blocks is like setting up two looms – one on shafts 1-4, and the other on shafts 5-8. That worked, and it turned out that I could use a couple of the same tie-ups twice, so I ended up using only 6 treadles. I learned a lot from the sample – took out some warp threads and did some rethreading. Also, this is textured yarn (Halcyon Block Island Blend), and (after washing) I got a huge amount of tracking in this large sample (but didn’t have tracking in the small sample – see first photo, above). By this I concluded that I needed to beat harder for this yarn, making the plain weave interlacement tight, so it wouldn’t move about in the wash. I hadn’t warped on enough for another sample, so trusted I had made enough changes and went on ahead. I hadn’t seen a description of this anyplace, and now I know why! Talk about hand-manipulated weave! However, I’m almost half done now, and it seems to be going well. More on this when it’s off the loom. Soon after I started weaving (still on the rigid heddle loom), an acquaintance invited me to a meeting of the local weaving guild. Well, actually they had changed their name to a textile arts guild, because many members (weavers, all) were also interested in spinning, dyeing, and other fiber arts. It is a really nice group, with interesting speakers, and the show and tell is inspiring. When the person who was doing the monthly newsletter needed to let it go, I volunteered to take it on, and people forward me all kinds of interesting info to pass on. There were several people in the class I took at Richmond Art Center last year who belong to another local weaving guild, but they were all quite experienced, and I thought it would be too advanced for me. However, with a year of floor-loom weaving under my belt, when I was invited to go to a meeting of this other guild, I was very interested, just to see. I’m so glad I did! This is a large, dynamic group, completely focused on weaving. They had an inspirational speaker, who shared her 53 years of very colorful weaving (see bonietarses.com). I was right, these are experienced weavers, but very friendly, and they said nice things about the two tencel scarves I brought for show and tell. And, in order to join this guild you have to bring at least 3 pieces to be juried. At the meeting I went to there were 4 people who were juried, and their work was very impressive. The next jurying isn’t until October, so I’ll hope to have some pieces nice enough to get me in! Two weaving guilds seems like a lot, but I’m going to stay with both. My original guild, though not entirely weaving-focused, brings in a wide variety of artists as speakers, and I really like my mind (which, heretofore has spent a lot of time with spreadsheets) to be expanded by the very different sensibilities of people who make their life around art. Wow! 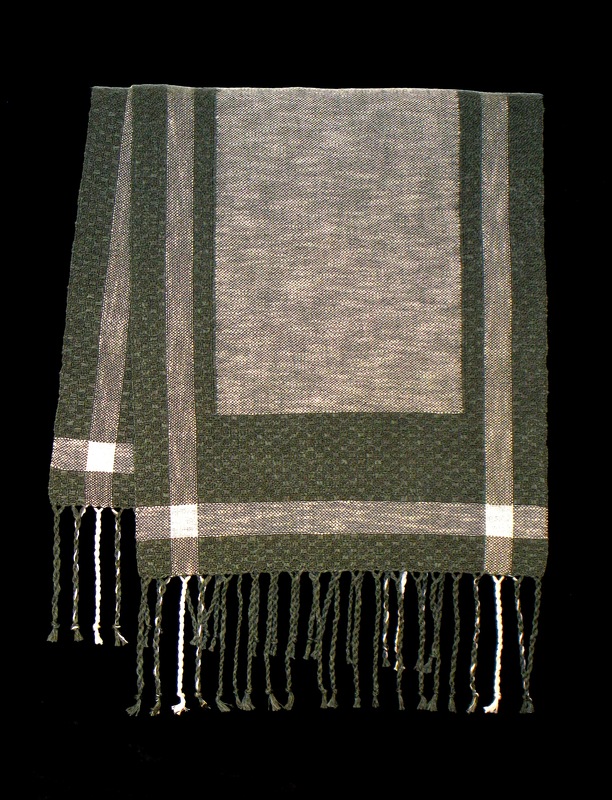 When I took up weaving, I thought it would be a nice pastime. Now, not only has it taken up my life (and living room), but I am finding creativity I never knew I had, and meeting people who expand my horizons. What a great life!